Brent Crampton ~ Omaha, Ne - A dance event with world-beat music featuring DJ's Brent Crampton and Greg Jackson with live percussionist Shif-D and host, Jay Kline. Presenting a new concept in music and dance, the event is geared towards eclectic music while transcending demographics. 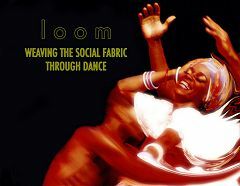 loom will take place at Espana Tapas Bar (6064 Maple St.) on March 9th, from 9 p.m. - 1 a.m., with a $3 cover charge. Community instruments will be available for dancers, and a special late-night tapas menu with drink specials will be for sale. This is not just about dancing, music and drinks. Rather, we want to create a communal experience - people coming together, using music as a mode of fellowship and release. With an environment and music incorporating Latin, African and American culture, this event is geared towards an eclectic crowd with all ethnicities, religious, cultural and social backgrounds. This is about creating a positive, worldly, uplifting atmosphere. Past events involving DJ's and electronic music have often been marketed to the post-rave generation demographic. While there is a certain mark of loyalty within this group, there is also an extent of predictability in who you'll see walk through the door. When others, who do not engage this culture, hear something about DJ-so-and-so playing house music, they may associate this with the often ambiguous and misused umbrella term, "techno" and disregard the event. Meanwhile, house music should rather be viewed as a rhythmic template with a plethora of musical genres and influences to pull from. Limiting house music to only the post-rave demographic is overlooking the colorful and diverse backdrop the music protrudes. Namely, there are types of house, and sub-genres that are related to house, that are contemporary takes on widely recognized forms of music. Latin, Soul, Afro-beat, R'n'B, Jazz, Bossa Nova, Hip-Hop, Salsa and Tango, to name a few, are all forms of music that have been adapted in contemporary, electronically-minded forms. Much of this music, though, isn't readily available or known to the public at whole in Omaha. Our event is going to take these intangible forms of music and bring it to the peoples in a way never before seen in Omaha. So musically speaking, who is this night for? It's for those who like world flavored house music, it's for those who like house music but don't know it yet, and it's for all those who are lover's and dancer’s of rhythmic music of old and new traditions. Big clubs are a focal point for the masses, but often at the sacrifice of homogenizing the personal connection with people. Instead, we are going for a small, intimate and hospitable venue. Instead of attempting to acquire 500+ participants during a night, we want 50+ people that are serious and light-hearted about creating a positive, uplifting landscape that will facilitate an escape through music. Espana will also provide a late-night tapas menu and exclusive drink specials. In order to accentuate the rhythm in the music, a hand-drum percussionist will be on site. In addition, we will be providing various instruments for the crowd to pick up and join in on the musical creative process. Community instruments such as tambourines, morraca's and hand-drums will be on site.